I would have a Green Thumb Sunday picture up, only my hard drive died at 11:50 on Friday (actually, probably before that; 11:50 is when I tried to turn it on) and I can’t find the software for my camera on the one I’m using now, Eric’s old one. Luckily I knew this was liable to happen and I backed up my files, but it’s still an inconvenience. Perhaps it’s also lucky that I badly misjudged my Three-Day Novel outline, and I’m done after ten thousand words. So instead of writing and posting pictures, I’ve been picking lots of tomatoes, the first jalapeño I’ve ever grown long enough to turn red, and a cucumber from the vine I thought was dead; slow-roasting the Garden Peach tomatoes and eating the last of the fresh salsa; picking feverfew, Hidatsa Shield Figure bean, and safflower seeds; putting away some of the fermented tomato seeds. The yard badly needs attending to, but neither Eric nor I are motivated enough to do it. Instead, we’re goofing off, eating tabbouleh and shopping for a new hard drive at Newegg.com. I’m finding much enjoyment in dried beans this year. My bowl full of Hutterites is still on the seed-saving bench, and I run my fingers through it occasionally as I pass by. I’m collecting Mitla Black tepary beans in a different bowl as I find them (they grew up the tomato stakes and corn stalks, so every once in a while I spot a few dried pods), and I love cracking open the pods and pushing my thumb along the inside to make the little beans pop out. I look forward to the ripening of the Hidatsa Shield Figure beans, which are still twined green and plump around the fallen sunflower stalks. I can see how having pounds upon pounds of dried beans would turn shucking into a chore, but with the small amounts I have it’s a pleasure. This weekend I’m embarking on another pleasure, not a new one but one I haven’t done for five years: the Three-Day Novel contest. I don’t enter it officially (except the first year), because it costs too much, but it’s great insane fun. I’ve been behind on getting my outline together, which is why there’s been no gardening this week other than picking some tomatoes and herbs. The Hopi Red Dye amaranth needs using; the lemon balm needs seed-stripping. Oh well; that’s what next week is for. “How much are the peaches?” asked the lady in front of me at the farmer’s market. I had a melon and some peppers and some parsley, and all I needed before getting back to the car and out of the heat was peaches. “Three dollars,” the woman behind the stall replied, and started putting the peaches in a bag. “All right,” said the lady, holding up a voucher. “That makes nine. What can I get for a dollar?” Her daughter started arguing that they didn’t need to spend the entire thing right then; the vendor started discussing the vouchers in general; and I perceived that I’d be a while getting my own peaches, so I walked down the corridor to the other vendor I’d seen with Red Havens. “Oh, that sounds good,” the lady said. “I’ll take them.” She handed over $5. “Do it,” he said, and pulled out two dollars to match my three. “You’ll love them,” the vendor promised, handing the last big tub to Eric. “They’re just picked, and very juicy.” As soon as we got them home I picked a bad-looking one, speckled with black, and cut away the bad portions and tried one. He was right. I had two more throughout the day and I remain pleased with my purchase. Today’s helpful tip of the day: one-inch-thick wooden stakes are not strong enough to hold up healthy tomato plants in August. My Roma and Persimmon plants are tumbled about because a stake each snapped sometime in the past day or two. I think I have some metal poles from the fencing we took out of the driveway. If not, well, I hope they’ll be okay. I’m gripped by the fear that my tomato plants will all snap their stakes and succumb into heaps of vines and rotten fruit. We made gazpacho yesterday, and I dried some tomatoes in the oven for later pizza/salad use and made some sweet salsa. Unfortunately I realized too late that the recipe was for canning, and since I wanted it fresh I oughtn’t have cooked it or added the lemon juice; but it was too salty anyway so perhaps it doesn’t matter. I started cutting up more tomatoes to throw in to alleviate the saltiness, then stopped, partly because I didn’t want to throw good tomatoes after bad and partly because it was bedtime. Today I’m slow-roasting the rest of the Garden Peach tomatoes (which I’m really loving: the fuzziness is unnoticeable in the mouth and they’re tasty and prolific, and they start to become both sweet and tinged with pink when they’re very ripe), as Eric is squeamish about yellow pasta sauce. I notice I still have some yellow pasta sauce in the freezer from last year. I must use that up. My loss-of-tomatoes fear is acting here, too; I’m afraid I won’t really get red tomatoes in any quantity and we won’t make enough sauce to even be worth trying, and Eric won’t eat yellow/orange salsa either (though that’s probably a point in favor of using the yellow and orange tomatoes for it, considering how much I love salsa), and frost will come and I’ll have only my single can of peach salsa (too much cumin) and memories of freshness. This is almost certainly not true, but I fear it. It was very fall-like yesterday; it was beautiful, but I wanted it still to be hot and humid and July. But I’m not going to let my fear of fall spoil my late summer. 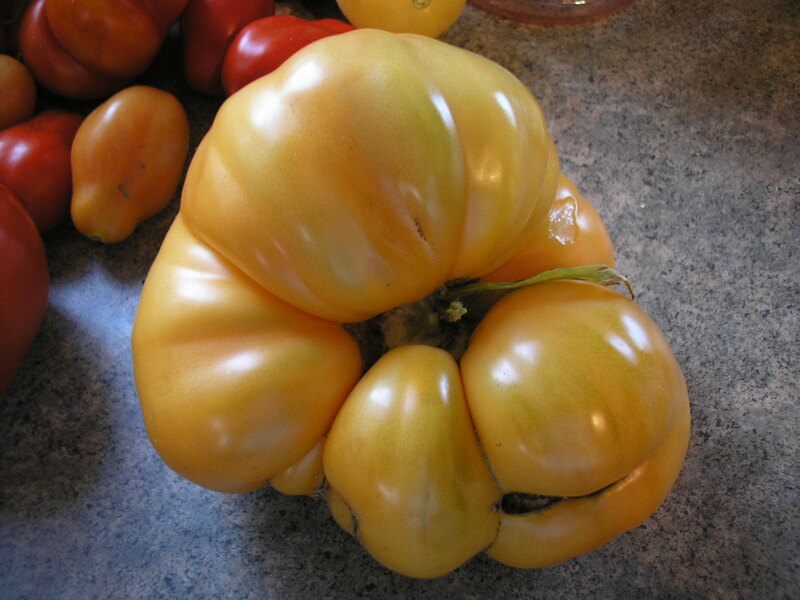 Well, I’ve got at least a contender for Carol’s World’s Ugliest Tomato contest. My Persimmon plant, which I have been eagerly anticipating, has finally yielded some ripe fruit. 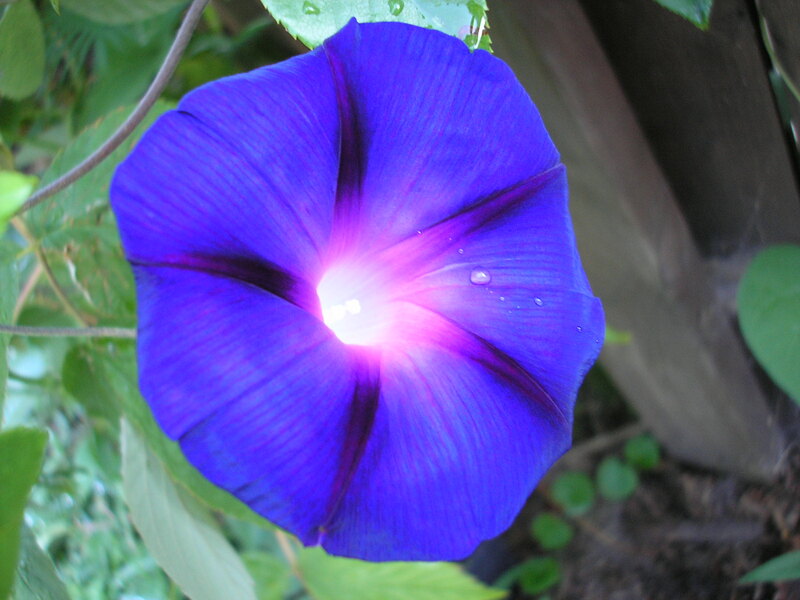 The morning glories I got from Colleen are climbing all over the fence now, and every morning when I go to work they trumpet their brilliant colors at me. It’s almost enough to make me happy to be going to work. I come home and they’re tight little mauve buds, but I remember their loud early selves. I’m finding myself very busy with Eric gone. I’ve got a quilt to finish, a freelancing project to do, cleaning, cooking, spinning, reading, and of course working in the garden. The bean arch is sagging again because I skipped picking beans in favor of starting some sweet relish while I worked on dinner. That’s cooling now, and the whole house smells like sweet-and-sour. The cucumbers are starting to slow down, but we’ve used what they’ve given us, that’s for sure. I picked four cucumbers today, and lots of tomatoes. 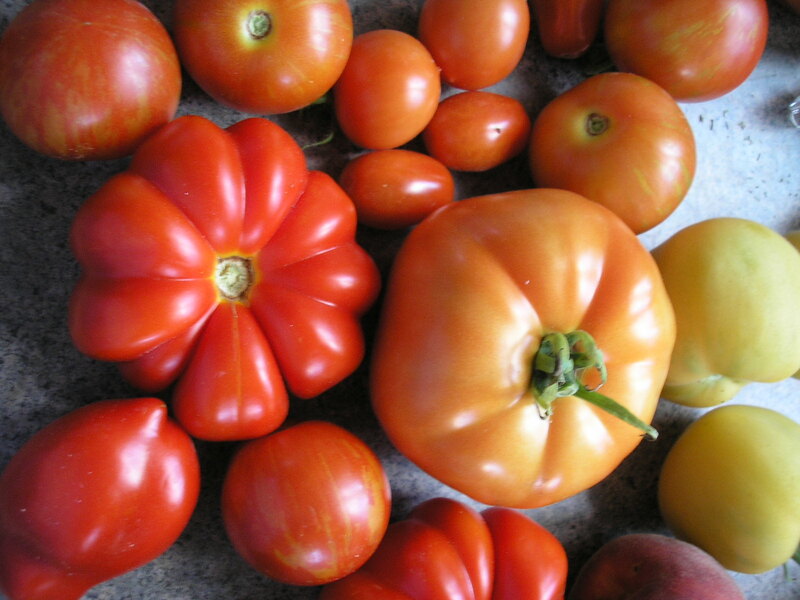 I discovered the problem with not knowing what each of my tomatoes is: my spatial memory is not the best. I have a couple of Italian Market Wonders that are pinkening. 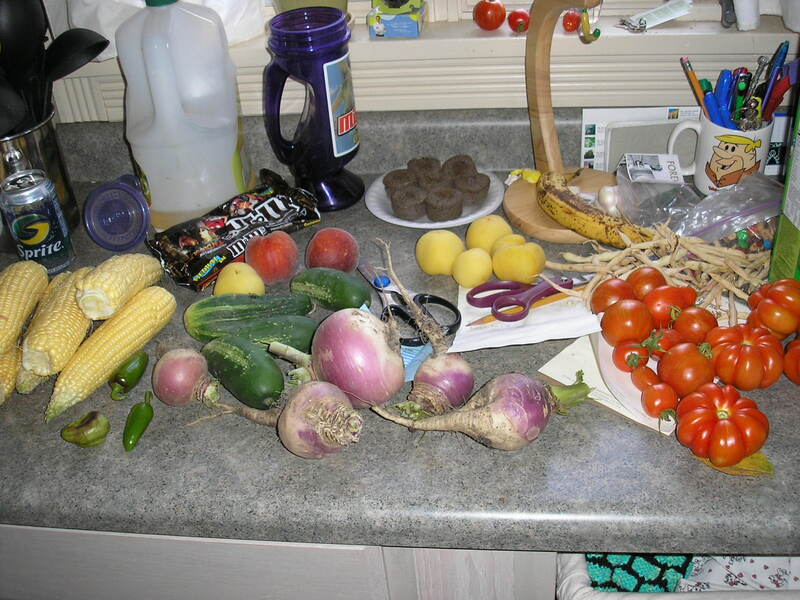 That leaves the real Zapotecs, the Black from Tula, and the Persimmon, and then all the tomatoes will have come in. How they’re going out, though, is an even bigger rainbow of possiblity. I suspect that most kids’ first real exposure to biology is the metamorphosis from caterpillar to butterfly/moth. Yet I doubt many of us have seen a cocoon. I hadn’t until yesterday, when I was picking the Hutterite beans (such a better harvest than last year’s) and saw this. Now that’s biology in action. Isn’t it fascinating? Of course I killed it right after because that’s a cabbage worm and I still have hopes about my brassicas, but still: living science! Now this is more like it! Salsa is on the menu for tomorrow. It would have been tonight, but I already stuffed my extradinner self with corn. I harvested seven ears and offered them to the mothers, but they’d already eaten, so I boiled them for four minutes as instructed in my cookbook, ate one over the sink while the others were cooling, and packed the rest for freezing. Six ears of corn makes five and a half cups of corn kernels, if you were wondering.